The SS-40 is a device for monitoring high voltage RF signals. 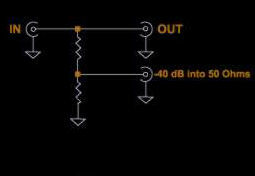 One output has no attenuation and a second provides 40 dB of attenuation into a 50-Ohm load. In some applications, it can be used as a simple diplexer.